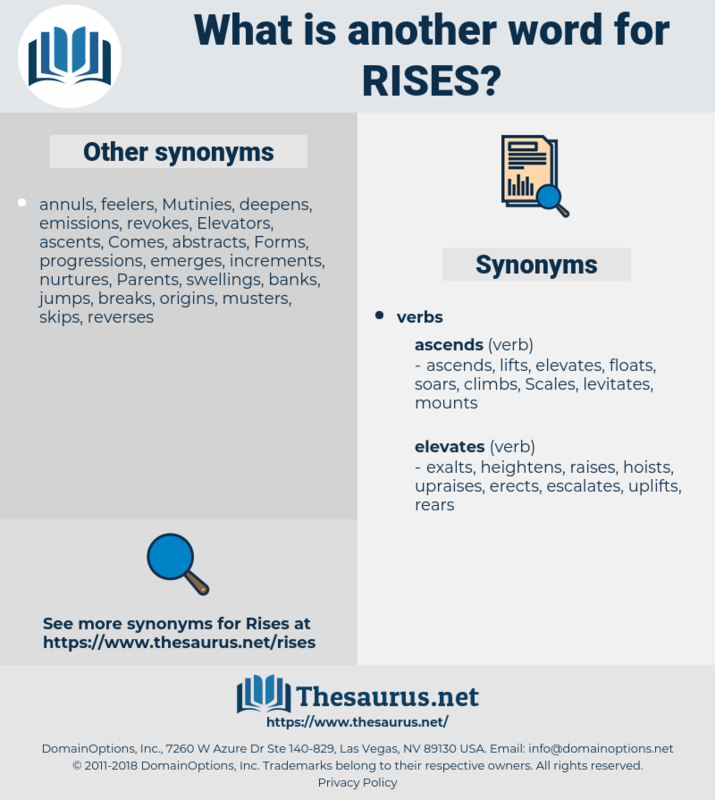 What is another word for rises? 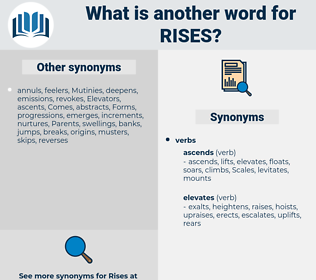 surge, surges, soar, soars, climb, climbs, hike, hikes. rebounds, advances, surges, soars, climbs, hikes. submits, sends, removes, additional, leaps, sues, breaks, upgrades, files, cancels, UPS, added, pushes, buoy, add, tops. incrementals, intensifies, rides, improvement, improvements, improves, issues, escalates, incremental, appears, enlarges, escalate, develops, Charges, arisings, upstairs, increments, expands, surcharges, enhancements, augmentations, spurts, upwards, fluctuations, advancement, Premiums, enhances, emanates, proceeds, augments, Adjustments, pressures, Prices, Records, press, extends, Indices, boards, litres, moves, L, closer, liters, allowances, altitudes, passports, Pensions, Incentives, stocks, sides, tariffs, Travels, peaks, passwords, FARES, Drills, additions, markups, fades, upgrade, Rages, Grains, fuels, Bonuses, gifts, runs, passes, wheels, tolls, pull-ups, makes, leaps. exists, arouses, expansion, progresses, transpires, necessitates, emerges, outstrips, transitions, grows, suffers, accelerates, strengthens, exacerbates, heightens, drops, presents, arrives, appreciates, represents, closes, SITS, springs, thrives, Strikes, revives, improving, eliminates, poses, source, aggravates, intensifies, exits, shifts, starts, falls, surpasses, multiplies, confers, assumes, shines, begins, rates, switches, transcends, is, contributes, lies, underpins, assembles, outweighs, accomplishes, occurs, enters, waives, rides, sweeps, requires, creates, improvement, improves, recovers, divides, becomes, maximizes, Drives, sets, elevates, exceeds, reinforces, spends, consists, examines, seems, amplifies, widens, fulfils, escalates, Rests, stops, fulfills, qualifies, supplements, involves, Leaves, awakens, attains, relies, converts, proves, breeds, appears, achieves, enlarges, escalate, depends, dirty, edits, stands, opens, turns, engages, varies, develops, implies, reaches, leads, magnifies, same, brings, builds, request, happens, toughens, continues, increments, feeds, expands, shoots, Levies, ranges, hears, equates, promotes, bounces, roll, advancement, flies, wakes, hinges, enhances, quits, crosses, looks, rebounds, awake, nudges, proceeds, dodges, augments, sums, flows, Affects, Prices, Met, meets, Comes, hits, goes, walks, extends, draws, compounds, kills, sounds, lays, bucks, begs, litres, adds, moves, places, L, tip, fits, tosses, takes, asks, dawns, matches, totals, POPS, zooms, Travels, puts, gets, mounts, runs, passes, dates, amounts, removes, makes, additional, pushes. A great man rises, shines a few years, and presently his body goes to the grave, and his spirit to the home of the soul. Some were mere rises, whilst others reached a height of considerably over one hundred feet. rick, reuse, rakish, rook, rice, ras, rickey, rushy, reccy, rich, rioja, recce, roach, rehouse, rajah, reissue, rachischisis, rye whisky, risc, reassess, rig, rococo, rosacea, rug, recuse, re-echo, race, Reyes, reggae, risque, rhesus, riches, r.c., reecho, raise, resh, ruckus, rousseau, rocky, rack, Rex, rush away, riga, rouge, rissa, rehash, rehearse, raucous, rask, row house, rhexia, roccus, reich, rachis, roc, rosaceae, rash, rough-hew, ross sea, rose, reek, rookie, rhus, rockchuck, rous, rag week, rage, rose acacia, ross, roughish, risky, roux, rock, recess, ragi, ragee, rosy, rusk, Rus, ricksha, rogue, rag, richea, ruscaceae, ragusa, RG, raja, risk, roughage, raree-show, ruse, recco, ruscus, reseau, rockies, rock cake, resize, res, roughhouse, rescue, rucksack, rorschach, Rya Rug, racy, rework, rough, raceway, rush, rough-house, re-argue, resew, razz, rouse, roguish, reach, rosa, raze, ruck, rejig, roseau, rosaceous, rejoice, rico, rase, ruga, rickshaw, rye whiskey, raj, russia, rake, rugose.